As I sit on the side of her hospital bed watching her sleep, I gaze down at our hands, mine holding hers gently. Her fingers twist and turn with arthritis, their knuckles large and knobby. For the first time in quite awhile, my hands look young to me. The blue rivers of her veins are covered by layers of skin that appear to be as thin as gossamer, as fragile as butterfly wings. My own thinning skin looks suddenly robust and dense, merely sharing hints of the blood that flows below in contrast to this elderly woman’s near x-ray like projections of her vessels. Age spots and wrinkles that have recently appeared on the backs of my hands are difficult for me to find when I compare them with the crevices and marks that cover her hands. When my children were infants, I spent countless hours examining their hands: the pudgy rolls of flesh; the short, full fingers; the tiny, curved fingernails. “Do you know what these hands will do?” I asked them aloud. And as they gazed up at my face, I would create a list, a litany of sorts: These hands will clap with excitement. These hands will hold cheeseburgers. These hands will write stories. These hands will hold other hands and cradle babies and touch all kinds of people I will never know. The very thought of just one portion of these little bodies performing so many tasks overwhelmed me with wonder and excitement. We do so much of our interacting with the world through our hands. They allow us to perform endless daily tasks; and they enable our connections with others in countless ways. Examining my babies’ small palms and fingers became a portal through which I visualized the lives that were still to be created by and through them. This daily ritual of mine was a consecration of sorts; I was blessing all the future actions of these little hands and the ways they would in turn bless the world. What is the entirety of ways one pair of hands can be utilized throughout one lifetime? As I held the hands of my small infants, I found it so challenging to imagine those tiny digits holding musical instruments or sports equipment or pots and pans. And it was even more challenging to visualize these infants living into the fullness of lives not yet mapped for them, much of which would involve these pudgy palms and full fingers. Equally challenging is it to imagine the multitude of things these hands in mine have done over the many decades of my patient’s life. And I am once again overwhelmed with wonder and excitement. 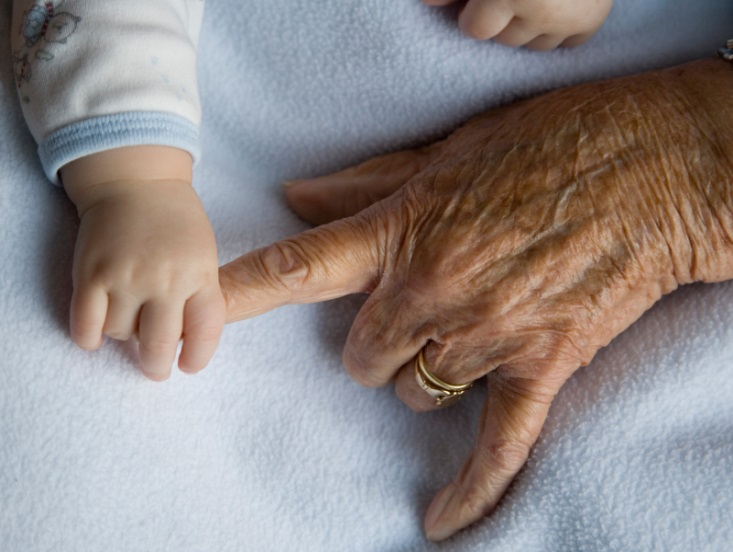 “Do you know what these hands have done?” I begin the litany, the praise of a lifetime of chores and challenges, of caring and caressing held in these wrinkled hands. She gazes up at my face, as expectant as my little ones used to be.